The Juniata River Water Trail provides access to a river system paralleling the route of the historic Pennsylvania Main Line Canal. The trail is a component of the Pittsburgh to Harrisburg Main Line Canal Greenway, Pennsylvania's designated Millennium Legacy Trail. It provides a unique perspective on the remnants of canal structures along its length while connecting to other recreational trails including the Appalachian Trail, the Standing Stone Trail, the Lower Trail, and the Mid-State Trail. Location: Frankstown Branch from 40 28 23 N, 78 16 02 W; Little Juniata River from 40 40 08 N, 78 14 26 W and Juniata River to 40 24 45N, 77 00 55 W.
Access points at Amity Hall, Green Valley, Howe Township Park, Newport, Greenwood, Millerstown, Thompsontown, Muskrat Springs, Walker, Mifflin, Mifflintown, Lewistown Narrows, Victory Park, Locust Campground, Granville, Newton-Hamilton, Shawmut, Mt. Union, Mapleton, Juniata Point, Smithfield Riverside Park, Portstown Park, Warrior Ridge Dam, Petersburg, Alexandria, Alfarata, Mt. Etna, Williamsburg, Ganister and Flowing Spring. The headwaters of the Juniata River Water Trail rise in the eastern slopes of the Allegheny Front, a defining feature of Pennsylvania's geography and a formidable obstacle to European settlement in the 18th century. In those days, the Juniata River served as a thoroughfare for Native Americans and early frontiersmen who established far-flung trading posts. With the Pennsylvania Assembly's 1771 declaration that the Juniata was a public stream and highway for navigational purposes, the river valley became a major route between the settled areas of the east and the fertile valleys of the west. When the Pennsylvania Main Line Canal was authorized in 1827, its route west from the Susquehanna River near Harrisburg paralleled the Juniata River. When completed in 1834, the travel time from Philadelphia to Pittsburgh was cut from 23 days to just 3½. Today, the Juniata River Water Trail covers 142 miles of the Juniata, the Little Juniata and the Frankstown Branch, stretching from Tyrone on the Little J and Canoe Creek State Park on the Frankstown Branch to the river's confluence with the Susquehanna at Duncannon. The entire Water Trail is rated A-1, flat-easy water, perfect for beginner paddlers. Flowing through a predominantly rural landscape, the stream remains clean with good fishing. All sections of the Juniata and its branches can be paddled between February and late May and possibly a few weeks in December. If the summer is wet, it is floatable into early July. Once the Juniata becomes a mature river on the mainstem near Huntingdon, paddlers can often travel until mid-August, and often again in November and early December. Floating speed is 2-3 miles per hour. Along the way, paddlers will find geologic formations, including Indian Chief Rock near Williamsburg and the Lewistown and Jacks Narrows. Nearby are the Thousand Steps, part of the Standing Stone Hiking Trail. The famed Appalachian Trail passes through Duncannon, where the Juniata meets the Susquehanna River. Throughout the trip down the Juniata, stone arch and iron truss railroad bridges cross the river and remnants of locks, aqueducts and culverts built to carry the Main Line Canal to small, isolated communities throughout the river valley can be seen along the river banks. The Water Trail offers the opportunity for primitive camping at many public islands while outfitters, commercial campgrounds, and bed and breakfasts in historic river towns cater to voyageurs, making it easy to continue on the Juniata for several days at a time. The Juniata River Water Trail is a component of the Pittsburgh to Harrisburg Main Line Canal Greenway™, a 320-mile corridor of natural wonders, history, culture, and recreation following the path of the historic Main Line Canal. Managed by the non-profit Allegheny Ridge Corporation, the Greenway is Pennsylvania's federally-designated Millennium Legacy Trail. 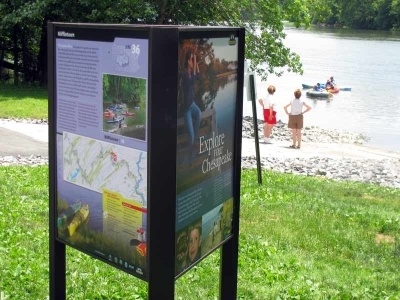 Access points along the main stem and the Frankstown Branch of the water trail are marked by river mileage signs and interpretive panels that provide safety and river orientation information to paddlers and anglers. Other interpretive signs tell the history of the Main Line Canal, agricultural activities, and the abundance of animals throughout the corridor, including over 200 species of birds. Birds aren't the only things to be seen in the air near the Juniata River Water Trail. Near Canoe Creek State Park, an abandoned church close to the beginning of the Frankstown Branch of the trail is home to a colony of 20,000 bats. Every evening between June and August, the bats take flight while visitors spread out blankets in the grass to watch the spectacle. The Juniata River also hosts the Pennsylvania Fish & Boat Commission's American Shad restoration program, aimed at re-establishing this once-plentiful fish. The restoration program includes raising 10 to 20 million shad fry annually and stocking them to restore the spawning waters of these ocean-dwelling fish. River stewardship efforts of scores of volunteers, non-profit organizations, and state and federal agencies also target the elimination of invasive plant species and restoration of native vegetation along the river's banks. Establishment of riparian buffer zones protects the Juniata against run-off pollution from farm fields and roadways, while preventing streambank erosion. 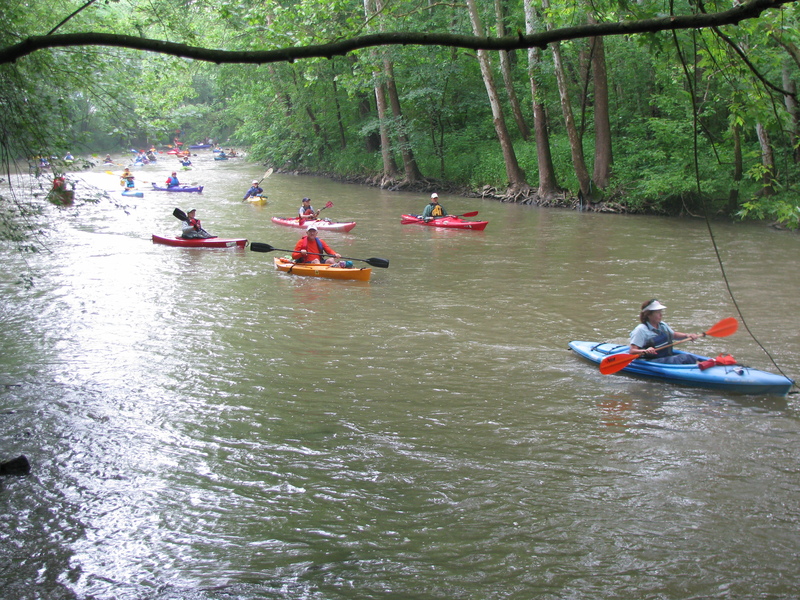 Each summer, the Juniata Clean Water Partnership (JCWP) sponsors a Juniata Sojourn on a section of the water trail, offering scores of kayakers and canoeists the opportunity to experience a multi-day adventure filled with information on history and natural resources. JCWP also provides environmental education to schools throughout the watershed. Maps and guides to the Juniata River Water Trail are available online from the Pennsylvania Fish and Boat Commission at www.fish.state.pa.us/watertrails/ or by contacting the Allegheny Ridge Corporation at info@alleghenyridge.org, or calling (814) 940-1922. The Juniata River Water Trail is part of the Chesapeake Bay Gateways and Watertrails Network, a partnership of more than 20 water trails and 120 parks, refuges, museums and historic sites in the Chesapeake Bay Watershed. To discover more about the Network, visit http://www.baygateways.net/. Trail signage. Photo by Karl King.